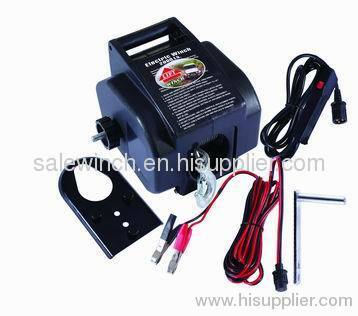 1)Convenient,portable power winch for pulling boats, stuck vehicles and other heavy items. 2)Powerful 2000 lbs. pulling capacity. 3)12V DC powered for convenient use without extension cords or small gas engines. 4)Portable, with built-in carrying handle and quick-attach mounting plate. 1)Power lead fitted with resistant plug and circuit breaker. 2)Remote switch with water resistant plug, for safe operation. 3)30' aircraft cable tow line with attached hook. 4)Mounting bracket for trailer hitch ball mounting. 5)Emergency crank handle and adjustable clutch.